Wait just a minute....what's the deal with that pan gasket? My favorite part about old british motorcycles is that the casting of the metal can be so bad and porous that the oil leaks through the metal itself lol. I think they used the same metal casting in my old Austin Healey 3000s and Jaguar XKEs.........they always leaked. And of course, Lucas electrics were part of the curse of British automobiles. Green gaskets are not alcohol resistant. 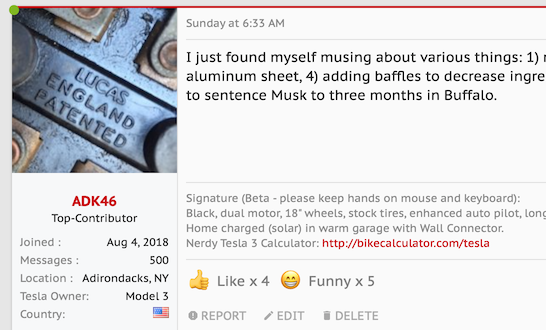 Regarding Lucas - I thought it would be funny if I used a Lucas-themed avatar on the Tesla forum, something I discovered in the Austin-Healey. It's a young crowd; seems to have largely gone unnoticed. Does that mean we can't drink beer while installing green gaskets? My solution on my '67 XKE was to paint the inside of the lower block with Glyptol, a GE coating intended for generators. Hint came from a "how to hot-rod the small-block Chevy" book by some guy named Smokey somebody. The goal was to smooth the surface so the oil falls back to the pan faster, and a fringe benefit is that it seals porous metal castings. On the XKE, the cast sump was "honed" on a granite plate with valve grinding paste to make the mating surface flat, then use no gasket. Dry as a bone. I'm not sure the Glyptol is still available thirty-plus years later. The scourge of my British bike experience was keeping things like clutch adjuster plugs in my Norton Commando. The "isolastic engine mounts" limited the vibration damage to the engine pretty well. Common Loctite wasn't enough to keep the plugs in though; I ended up gluing them in with weatherstrip adhesive (thick contact cement) similar to what we used to glue 356 cases together. Finding the "correct" sump gasket may be like Yeti or unicorn hunting. A firm enough core to allow torque to be used to get the bolt lengths even. A soft enough surface that the gasket will comply with the sump and girdle flanges, including that scratch made while cleaning off the gasket shellac the last guy used. Amazingly, the cork-neoprene composite gasket covers these requirements nicely, except it doesn't last forever. Plus the low tension on the bolts means they are prone to self-loosening. Enter thread-locker, or Hylomar sealant. A little non-hardening gasket sealant on the threads is enough to keep the bolt from falling out, yet allows a certain amount of adjustment as the cork gasket dries out over twenty-plus years. One thing we never had to worry about with the Jaguar was the cork sump gasket drying out. Related: I was looking for fasteners on another project, and stumbled upon bolts with nylon inserts to keep them from vibrating loose. I didn't look for them in 6mm sizes, but might for next time the sump comes out for something. Ah, this is option code M722 "Gaskets Matching Interior Leather." Glad Greg in his professionalism got the correct gasket for this customer! I don’t care what planet you’re from. That —^ right there is some funny $h!t. - do we get the whole story? - can we order these? I have two engines apart that want to know. Ariel's overheat badly. No wonder it's been out of the frame 20 years. I always thought they looked cool, unique sound, but they're not practical, never cared for the plunger frame ether. Yes, they all needed oil coolers...and cool weather to ride them. But the sound they make!! The metal problem is terrible. Every stud or bolt hole needs an insert...and there didn't used to be thread repair kits in British Standard or Witworth...not sure about today. Sad that it's so true. There's one about a Lucas Refrigerator that I can't completely remember...something about oil on your kitchen floor. Lucas fridges are why the British drink their beer at room temp. According to the dark web (another Lucas invention), these are prototypes. There are five of them. The "hole location" is being worked on...thus the hole size that is the same as the pan these were sized from. Seems that the pan hole location isn't the same as the block...and there is quite a bit of variance from year to year, pan to pan, and block to block. Cork and silicone are more forgiving than "trick" fibers. The one in this picture is staying where it is at, for testing purposes. Since the holes line up (more or less) with the oil pan, it should be fine. Zero sealant or anything on the stock hardware, for this one. ....There's a rumor that one is coming your way, for you to play with and critique. .....Along with a brand new design 14 pin loom with concours appropriate materials, hand built by the master, himself. Also for your use/critique. My Brough Superior SS 100, is all Witworth, except axel nuts and the girder front forks is British Standard. Matchless engine and transmission, it does not leak.